Perfect for many applications like school speech, a home karaoke and other audio use. Common connection in the audio industry. For a clear and balanced microphone connection in stereo frequency. 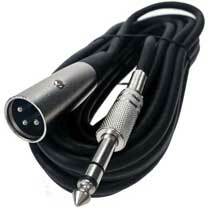 We, at SF Cable have a wide range of XLR to ¼” Stereo Microphone Cables. We have both male and female cables that range in length from 6 ft to 100 ft.
All our cables are of high quality and come at discounted prices as we source them directly from manufacturers (who are ISO certified). Our cables are available at the best prices online. We provide full post sales technical support and lifetime warranty on our all our cables and wires. Shop with confidence and get world class cables only at SF Cable!